October 17th is Take Your Parent to Lunch Day. This is a fantastic opportunity to spend quality time together, and focus on your parent-child bond and the meaning and love behind your relationship rather than just your caregiver efforts. For some elderly adults, however, this may not be an accessible choice. Your aging loved one may struggle with mobility issues and challenges that make it too difficult for them to go on such an outing. Furthermore, they may be dealing with cognitive functioning decline or memory loss that makes them not want to engage socially or they may have recently experienced an illness or injury that keeps them in the home. 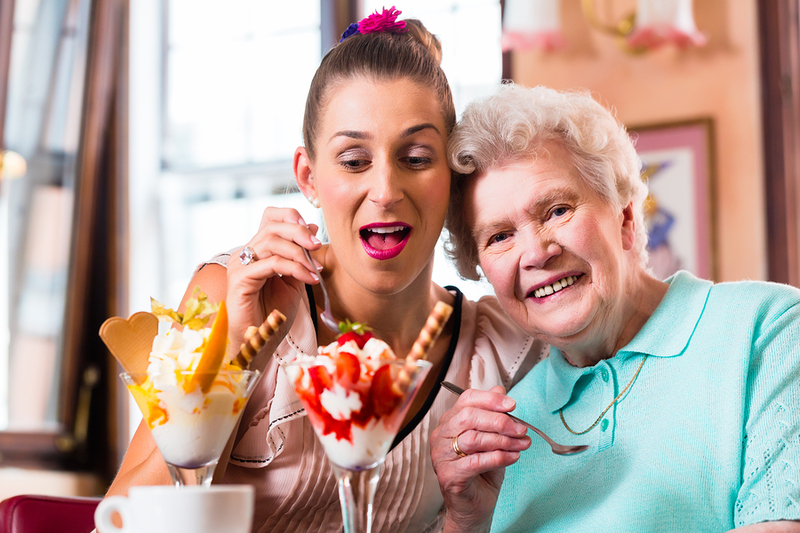 Whatever the reason, if your senior cannot leave the home to go out to lunch with you, it does not mean you cannot enjoy many of the benefits of enjoying this meal together. With some planning and effort, you can still experience this quality time, and make memories to treasure. Ask your parent their favorite restaurant, or choose a restaurant you used to enjoy going to together, and order takeout from that restaurant to bring over to your parent’s house. Make an effort to recreate some of the restaurant experience, such as setting out a bread basket, then eating an appetizer, then eating the meal. Try serving all of the food family-style to encourage talking about the food, sharing memories, and enjoying conversation. If your parent has dietary restrictions that make it so ordering takeout is not a good option for them, find out their favorite type of restaurant food, then work together to find recipes that utilize some of these same flavors or even replicate these dishes, but in ways that are appropriate for their restrictions. One of the most beneficial aspects of home care is it’s fully customizable in nature. This means as a family caregiver you can work with the in-home senior care services provider and your parent to devise a set of services specifically designed for your parent as a whole individual. Rather than the services being generic, or a blanket solution to common issues, they are specifically and purposefully designed to meet your senior’s individual challenges and needs, and also to address their personality, goals, lifestyle, and preferences. This allows your senior to stay healthy, safe, and comfortable, and pursue a higher level of independence and fulfillment as they age. Some of these services can include transportation, meal and snack preparation, physical support for mobility issues, medication reminders, companionship, and more. If you or an aging loved-one are considering Elderly Care in Lake Bluff, IL, call the caring staff at LifeCare Home Health & In-Home Services. Call (888) 606-4199 LifeCare serves all of the Chicago Metro Area.